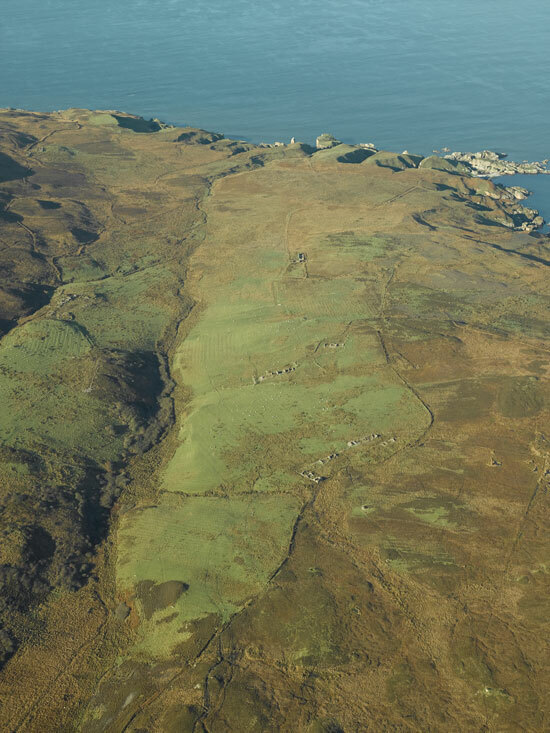 Images: Top, Steve Mithen Below, Crown copyright, Historic Environment Scotland This is a deserted township consisting of nine longhouses, two subsidiary buildings, six limekilns and a string of interconnecting stock enclosures and boundaries, seen at distance from the west, above, and in an aerial view below. Amidst the 19th century buildings are traces of probable prehistoric structures. 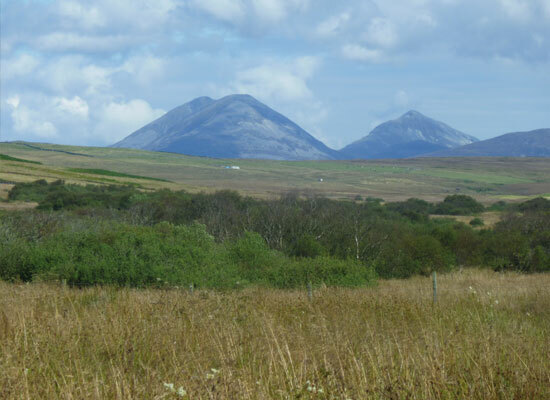 Nearby is the late Mesolithic site of Storakaig, dating to around 6,500 years ago, marked by the small white polytunnel below the Paps of Jura. 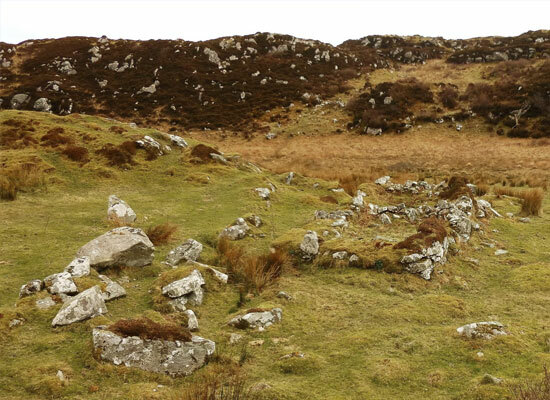 Just as at other key locations elsewhere on Islay, Àirigh Ghuaidhre was a favoured place for settlement throughout prehistoric and historic times. 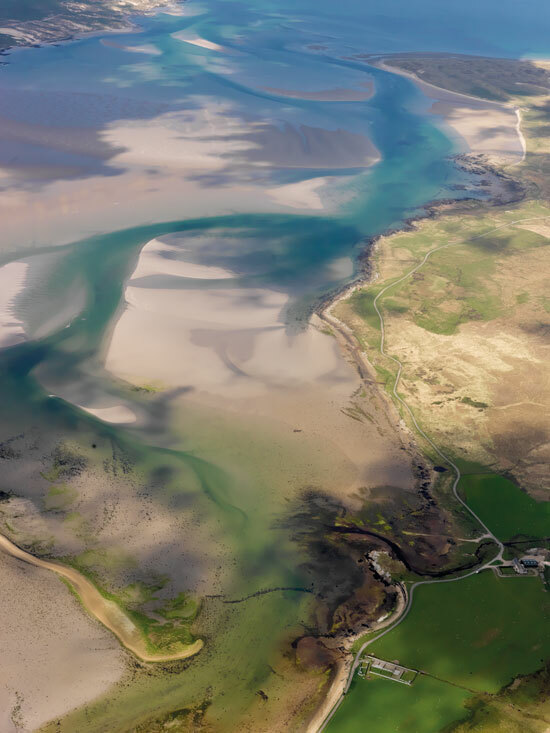 There is a fish trap running across a narrow part of the bay within Loch Gruinart, visible towards the bottom of this remarkable photograph. 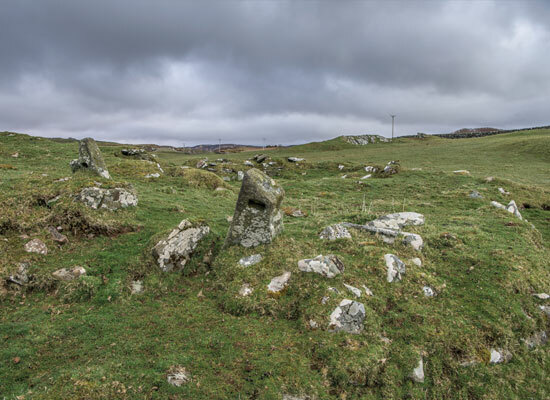 This particular fish trap is likely to date to the 19th century, but fish traps placed in tidal inlets would have been used around the coast of Islay from the earliest prehistoric times. 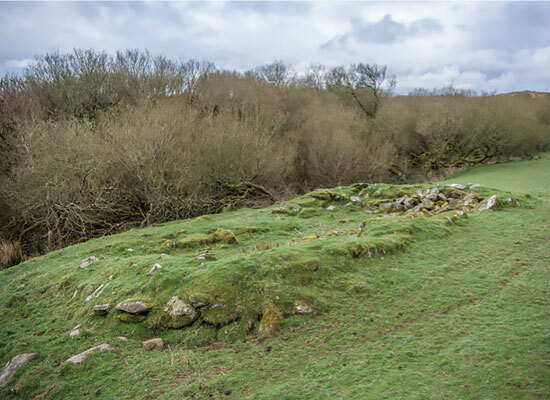 Here we have the remains of an ancient chapel, approximately 7m by 3.5m wide, within walls of 1m in thickness. It occupies the side of a circular 14m-diameter enclosure. A pair of socketed gate-piers flank the entrance, while a third pierced slab lies on the ground nearby. There are no traces of the well (tobar) that gives the site its name. 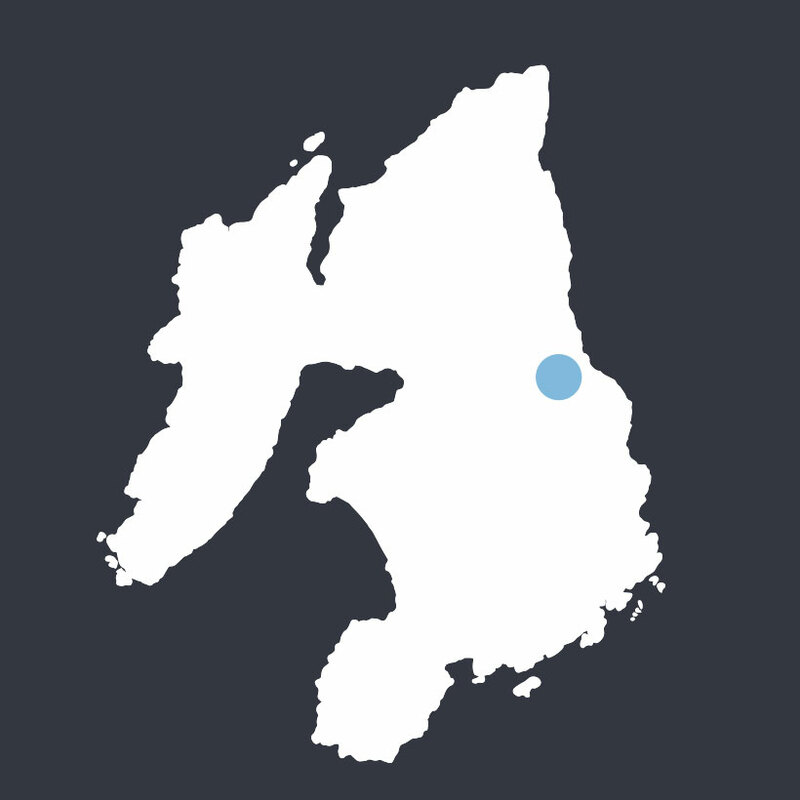 It is likely to have been dedicated to the Irish female saint, Lasair. 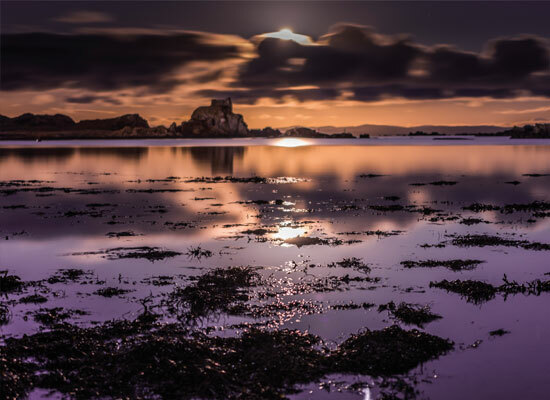 This castle was once an impregnable naval fortress of the Lords of the Isles, originally constructed on top of a fort. The remains of a 15th century keep and a 13th century tower survive, although much of what remains probably dates from the 16th century. After being forfeited to the crown in 1493, the castle was the object of much wrangling between the MacDonalds and rival clans, until the Campbell’s of Cawdor eventually took up residence. 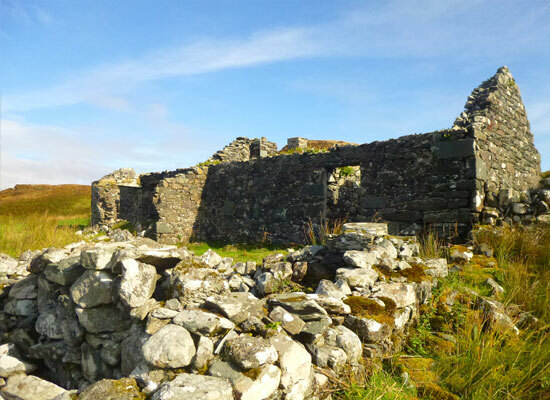 The deserted settlement at Glen Astle on the Oa includes: 4 ruined farmsteads with extensive fields and ruined walls on the south slopes, 2 spectacular lochs, a very well preserved historic water mill with the remains of the mill race, the pit for the mill wheel in very good condition. There are also the remains of a buttressed road at the bottom of the valley which emerges into a spectacular bay, surrounded by towering cliffs. You can see the remains of stone built fishing shelters, as well as a slipway which would have been used for fishing boats. Some of the Gaelic place names suggest a much longer occupation but all the remains that are to be seen today are historical. 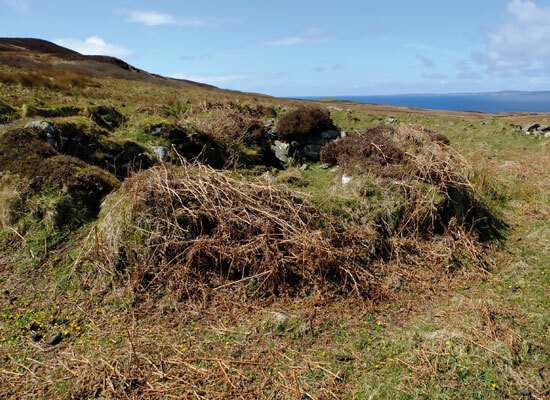 The ruins at Kilbride – St Bride’s Chapel – probably date to the 17th century. They represent a church built to replace those at Kildalton and Kilnaughton, arising from a decision in 1651. This chapel succeeds that of an Early Christian date, once represented by a cross-marked slab, now in the National Museum of Antiquities of Scotland. 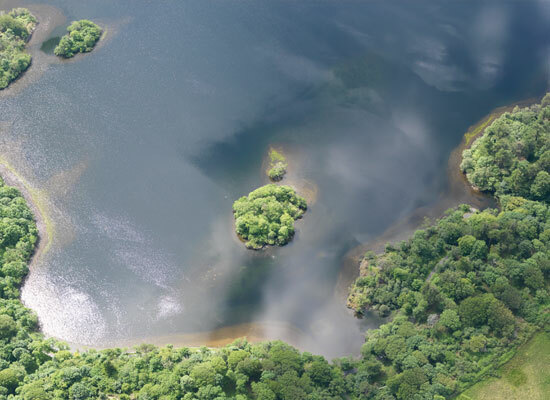 Crannogs are islands within lochs that had once been built upon, accessed either by a causeway or only by boat. 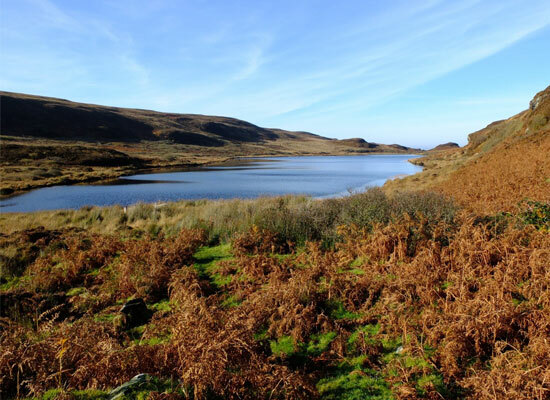 Six rectangular buildings constructed with dry-stone walls are found on the crannog within Loch Ballygrant. They are likely to date to the mid 16th century when the island was in the possession of the MacLeans of Dunart. 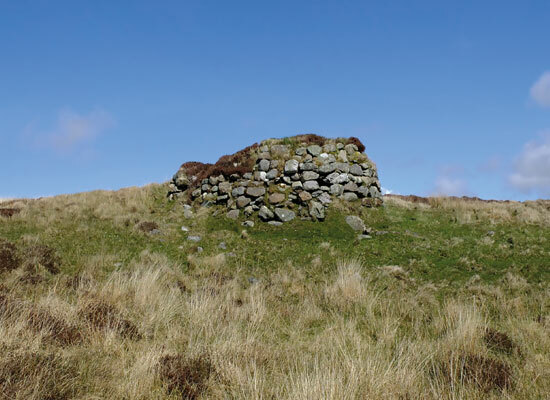 ‘Solam – in the glen about 500m to the southwest of this building lie the remains of a small crofting community that was wiped out by the plague in the 18th century. Local tradition has it that shipwrecked sailors may have brought the disease; in return for the kindness shown to them by the people of this small community, one left behind a mother-of-pearl necklace, which is thought to have harboured the germs that killed them all. The sick villagers were isolated, and neighbours brought food daily, leaving it a safe distance from the village. When the food was no longer eaten, the village was burned. 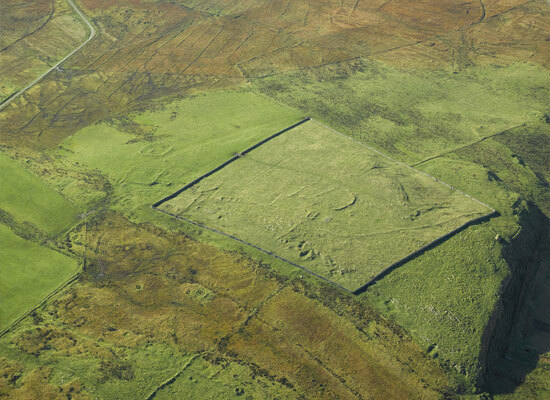 Outlines of one or two buildings can be traced in the grassy slopes on the north side of the glen. Directly opposite, below a steep rock face, lies the village water supply, St Michael’s Well’. These are two adjacent townships, located on either side of a burn on the Oa peninsular. Both were deserted in the late 19th century, partly by enforced clearances. The townships have long houses with multiple compartments, enclosures and extensive rig and furrow. Documentary evidence describes how in 1839 Tockmal had a population of 24 persons owning six horses. The images below the aerial photograph show a kiln found at Grasdale, which was most likely a lime kiln, and the remains of a medieval chapel at Tockmal.